Yokohama F. Marinos defender Yuji Nakazawa, who played in two World Cups for Japan, has decided to retire, the J. League first division side announced Tuesday. The 40-year-old center back played for Japan at the 2006 World Cup in Germany and 2010 edition in South Africa, but only appeared in 22 games in the top division last season due to pain in his left knee. The knee pain forced him to sit out a game last August, ending his string of 178 straight full games and 199 consecutive appearances, both league records for an outfield player. Despite undergoing surgery and treatment in September, the knee did not respond as well as expected. “While I was putting my thoughts in order after the season, I felt that it was time to take off this club’s uniform,” Nakazawa said in a statement through the team. Nakazawa, who spent time in Brazil after graduating from high school, joined Verdy Kawasaki (now Tokyo Verdy) in 1999 and moved to Marinos in 2002. He contributed to Yokohama’s league championships in 2003 and 2004, the year he became the first defender to be named the J. League’s MVP. His 593 J. League games are third-most all time. 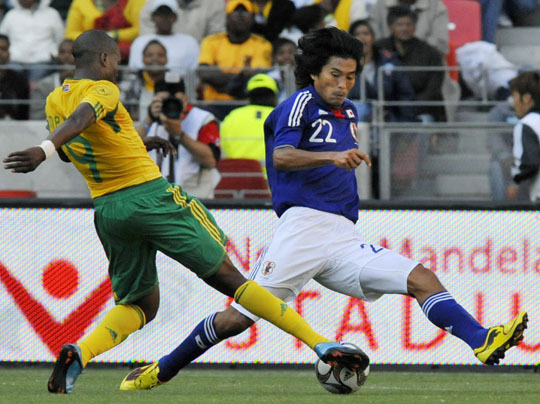 A longtime Samurai Blue stalwart, Nakazawa scored 17 goals and is tied for sixth among Japan internationals with 110 caps. 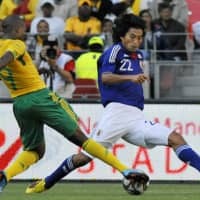 Japan defender Tsukasa Shiotani said Sunday he hopes to leave a lasting mark at the 2019 Asian Cup when he takes the field in his team’s Group F opening match against Turkmenistan on Wednesday. Shiotani, who finished his last game with Al Ain on Dec. 28 and was left out of Japan’s original Asian Cup squad, said he got a phone call while he was on vacation with his family in Malta from Japan head coach Hajime Moriyasu. “My instincts told me it was about being added (to the team). I thought it would be something he would want to learn about the UAE,” he said. Shiotani said that Moriyasu, who managed him at Sanfrecce Hiroshima, asked him to “lend us your power” during their chat over the phone. The Japan Football Association later announced that Shiotani and Takashi Inui would replace Hidemasa Morita and Shoya Nakajima, who each pulled out with leg injuries. Shiotani transferred from Sanfrecce to Al Ain in June 2017 and moved to the Middle East, a part of the world largely unknown to him. He said at first he felt lost at sea in such a different environment, where players make and receive injury threatening tackles on the pitch without seeming to mind. “I got tough and grew up mentally,” Shiotani said. The 30-year-old played in every defensive position for his new side last season and contributed to Al Ain’s runner-up finish at the Club World Cup in December. Shiotani may prove to be an X-factor for Japan in its final group stage match on Jan. 17 against Uzbekistan. The Samurai Blue are looking to unseat 2015 champion Australia and take home their fifth Asian Cup crown and first since 2011. Following Japan’s opening match against Turkmenistan, it faces Oman on Sunday.